At the beginning of this week’s Parashah, we read about the Korbanot that were offered at the dedication of the Mishkan. “He said to Aharon, ‘Take for yourself a young bull for a Chatat/ sin-offering . . .’ And to Bnei Yisrael speak as follows, ‘Take a male goat for a Chatat / sin-offering . . .’” (9:2-3). Our Sages explain that Aharon’s calf was to atone for his role in the Golden Calf, while Bnei Yisrael’s goat was to atone for their ancestors’ role in the sale of Yosef, when they slaughtered a goat and dipped Yosef’s cloak into it. R’ Moshe Sofer z”l (1762–1839; the Chatam Sofer; rabbi and Rosh Yeshiva in Pressburg, Hungary) notes that the Golden Calf and selling Yosef were different types of sins. He explains: The Midrash Perek Shirah teaches that the “song” of the wolf is (Shmot 22:8), “For every item of liability, whether an ox, a donkey, a sheep, or a garment, . . . to the court shall come both their claims. 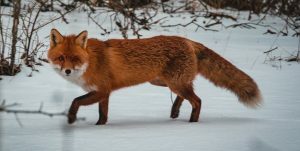 Whomever the court finds guilty shall pay double to his fellow.” The “song” of the fox is (Yirmiyah 22:13), “Woe to him who builds his house without righteousness and his upper stories without justice . . .” These songs illustrate the difference between wolves and foxes. Wolves are strong and violent, while foxes are cunning and deceitful. Violent strongmen can be brought to justice, as described in the wolf’s song. Cunning criminals are harder to bring to justice, as alluded to in the fox’s song. The sin of the Golden Calf was egregious, but it was committed in the open. Thus, it is reminiscent of a wolf’s behavior. The sin of selling Yosef was cunning and deceitful, especially dipping Yosef’s cloak in a goat’s blood–reminiscent of a fox’s behavior. The Gemara (Megillah 14a) asks why we recite Hallel on Pesach but not on Purim. After all, argues the Gemara, “If we recite Hallel on a holiday that commemorates the transition from slavery to freedom [i.e., Pesach], how much more so should we recite it on a holiday that commemorates the transition from death to life [i.e., Purim].” The Gemara answers that we do not say Hallel on Purim because, even after the Purim miracle, “We are still slaves to Achashveirosh,” i.e., we are still subjugated by, or subservient to, the nations of the world. R’ Yosef Shalom Elyashiv z”l (1910-2012; Yerushalayim) asks: Why then do we say Hallel on Pesach? Why don’t we say, “We are still slaves to Pharaoh,” as long as we are still subjugated by, or subservient to, other nations? Moreover, we say in the Pesach Haggadah, “In every generation, one is obligated to see himself as if he had personally gone out of Egypt.” Why do we view ourselves as having gone out of Egypt if we are once again subservient to other nations? R’ Elyashiv explains: The Gemara (Berachot 9a-b) teaches that Hashem asked Bnei Yisrael to “please” ask the Egyptians for gold and silver (see Shmot 11:2) so that Avraham would not accuse Hashem of keeping His promise to enslave Avraham’s descendants, but not keeping His promise to take them out of Egypt with great wealth (see Bereishit 15:13-14). However, writes R’ Elyashiv, this is difficult to understand. Is gold and silver what the Torah means when it refers to “great wealth”? Surely “great wealth” is the closeness to Hashem that one obtains by performing Mitzvot and studying Torah! He answers: When Hashem spoke of “great wealth,” He was, indeed, referring to the Torah that Bnei Yisrael would receive after the Exodus. However, not everyone appreciates the immense pleasure that can be obtained from studying Torah; not everyone considers that to be “great wealth.” Because of such people, Hashem had to make sure that Bnei Yisrael left Egypt with gold and silver also. Why do we mention Lavan and his plot in the Haggadah? One might ask, however, continues R’ Teomim: If the decree applied to Yitzchak and Yaakov as well, why did the later generations suffer so harshly while the earlier generations seem to have had an easier time? Indeed, since our Sages say that the entire decree was a punishment for Avraham for questioning Hashem, one would expect the generations closer to Avraham to bear the brunt of the decree! R’ Levi Yizchak Horowitz z”l (1921-2009; Bostoner Rebbe) asks: Why do we say, “Lavan sought to uproot Ha’kol,” rather than, “Lavan sought to uproot the females as well”? He writes: The answer came to me in a dream. The term “Ha’kol” alludes to women. For example, the Gemara (Yevamot 62a) teaches: A man who has no wife lives without joy, without blessing, without goodness, without Torah . . .” In short, such a person lacks Ha’kol / everything! We read (Bereishit 24:1), “Hashem had blessed Avraham Ba’kol / with everything.” The Gemara (Bava Batra 16b) states that Avraham had a daughter and her name was “Ba’kol.” In light of the above Gemara, we can understand why that name was appropriate. Siddur Avodat Yisrael cites a custom to recite Psalm 128 on the Shabbat on which Parashat Shmini is read. However, on the Shabbat when Parashat Parah is read, Psalm 51 is substituted. Accordingly, we present here verses from, and commentaries on, that Psalm. R’ Moshe Gruenwald z”l (1853-1910; rabbi of, and Rosh Yeshiva in, Huszt, Hungary) writes: Pirkei Avot (ch.4) teaches that learning attained in one’s youth is like ink written on new, unused paper, while learning attained in one’s older years is like ink written over an erasure. R’ Gruenwald explains: Erasing can never remove the previous writing entirely; there will always be an impression. Similarly, Torah learned when one is older, after he invariably has been subjected to inappropriate influences, can never completely overwrite what was in his mind before.